One was a foreigner and a peasant. The other, a reluctant queen to a man she hardly knew. But their stories have one thing in common: A remarkable faith committed to doing God's will. For both Ruth and Esther, God used stressful circumstances to bring about his eternal purposes. Ruth's commitment to the God of Naomi affected every generation to come, as she became an ancestor of King David and more importantly, Jesus Christ. Esther's obedience led to the preservation of her people at a moment in history when all seemed lost. 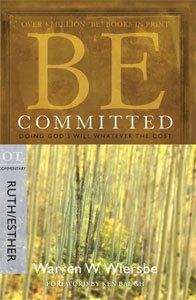 The stories of Ruth and Esther will make you contemplate: Would I trust God enough to do what they did? Go chapter by chapter through the books of Ruth and Esther to see how the lives of these two remarkable women epitomize the type of faith that glorifies God. As you read, ask yourself: How does God want to use my faithful commitment? Will he use your life to affect the generations to come, or will he use your life to impact the current generation? Either way, author Warren Wiersbe helps you to be prepared and be committed to God's will no matter what the cost.